Do not be confused, scrimps - adjustable crimps, are not seafood. 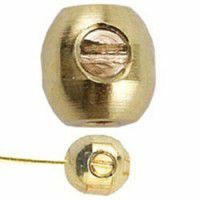 They combine a screw with a crimp to safely secure your beadwork on wire. Choose from a number of different sizes, shapes, and finishes. there are even scrimp finding that can be used in a host of different ways.